Background: Diabetes mellitus (DM) is a disease of global public health importance whose prevention and control may be largely influenced by improved knowledge amongst populations. This study set out to examine the level of awareness, knowledge, and some risk factors for developing DM among students of the Osun State University, Nigeria. Materials and Methods: A descriptive cross-sectional study was conducted amongst students of the Osun State University in South-western Nigeria. Study participants were recruited using multistage sampling technique. A self-administered semi-structured questionnaire was used to obtain information on respondents' socio-demographics; awareness, knowledge and perception of DM and lifestyle characteristics such as dietary habits, physical activity, use of alcohol, and tobacco smoking. Results: A total of 166 students participated in the study, 75.9% of whom have heard of DM and 40.4% of them correctly defined the condition. Seventy-two (43.4%) of the study participants erroneously associated excessive intake of sugar with development of DM. Nearly one-third (30.1%) of them did not know any preventive measure for DM. 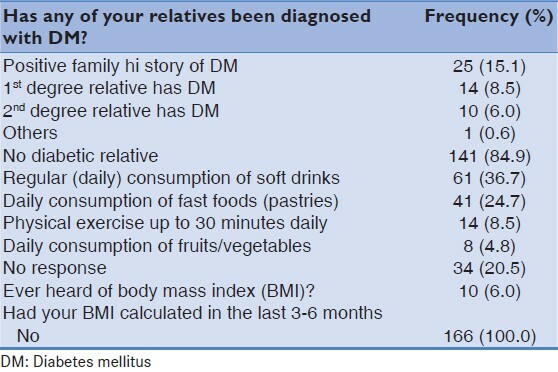 Fourteen (56%) of the 25 respondents who had a diabetic relative said the diabetic person was their first degree relative. Sixty-one (36.7%) subjects engaged in daily consumption of soft drinks, and only 8.5% engaged in regular physical exercise. Only 6.0% of the participants had ever heard of body mass index (BMI). Conclusion: This study showed high awareness level of DM among participants but the knowledge and attitude toward DM was relatively poor. Diabetes mellitus (DM) is a global public health disease with an extreme effect on the quality of life ,, and its prevalence is increasing at an alarming rate. Recent figures released by the International Diabetes Federation (IDF) indicate that the number of people living with diabetes is expected to rise from 366 million in 2011 to 552 million by 2030, if no urgent action is taken. The global increase in diabetes is triggered by many factors including the ageing population, unhealthy diets and sedentary lifestyles that heighten one's propensity toward obesity. In the industrialized countries, diabetes is common among the elderly in contrast with developing countries where diabetes most frequently affects those between the ages of 35 and 64. In some countries, DM also frequently occurs in youths. There is growing evidence that preventing and/or delaying the onset of diabetes is a viable option. , It is important to know about the awareness and knowledge level of a condition in a population, as knowledge is a critical component of behavior change. Once awareness is spread, people are more likely to participate inprevention and control activities. Various recent studies conducted in many parts of the world suggest that there is a lack of public awareness and knowledge of various factors related to diabetes. ,, Research has shown that education about diabetes resulted in a significant increase in knowledge of apopulation, which plays a vital role in future developmentand early prevention and detection of the disease. Thus, increasing public awareness regarding modifiable diabetes risk factors and healthier lifestyles, and developing strategies to identify and manage at-risk populations, are among of the various possible mechanisms being used to stem the present epidemic of diabetes in many parts of the world. This study therefore set out to assess the level of awareness and knowledge about DM as well as examine some risk factors for developing the disease amongststudents in Osun State University, Osogbo, Nigeria. This was a descriptive cross-sectional study conducted amongst undergraduates of the Osun State University in South-western Nigeria. The institution runs a multicampus system and has six (6) campuses across the geographical territory of Osun State, Nigeria. Stage 1: The Colleges of the Osun state University (eight colleges located on the six different campuses of the institution) were stratified into Science and non-science based Colleges following which out of the non-science based colleges, College of Management and Social Sciences (MSS) was selected by simple random sampling (balloting). The total student population of MSS college according to the composite departments' records was 1,185 as at the time of the study and the records also showed nearly equal distribution of the students by gender in the four levels (100L - 142 males and 150 females; 200L - 146 males and 128 females; 300L - 156 males and 188 females; 400L - 140 males and 135 females). Stage 2: Study participants were then selected from the six (6) component departments in MSS college (namely: Accounting, Banking/Finance, Business administration, Political science/International relations, Economics and Geography) immediately after attendance of a general college-based course after stratification by department and gender as follows: Study respondents were proportionately (based on the number of students per department and gender - as contained in the departmental records) recruited by simple random sampling (ballot method) across the four academic levels of study (100 to 400 levels). Data were collected with the use of a self-administered semi-structured questionnaire which collected information on the respondents' socio-demographics; awareness, knowledge and perception of DM and lifestyle characteristics in order to determine their risk of developing DM. The data collected were analyzed using SPSS version 17. Respondents in this study were adjudged to have defined DM correctly if they mentioned excessive passage of urine, excessive thirst associated with high blood sugar level. Ethical consideration: Ethical approval was sought and obtained from the Osun State University Health Research and Ethics Committee and all participants gave verbal consent. Confidentiality was assured by the study instrument not requiring names of participants but the questionnaires were serially numbered for ease of data collation. A total of 166 students (83 each of males and females) participated in the study. On the average, forty-two students were selected per year (level) of study. The recruited participants constituted about one-quarter of the student population available while carrying out the study. The respondents were aged between 16 and 30 years of age with a mean of 21.04 ± 2.94 years. 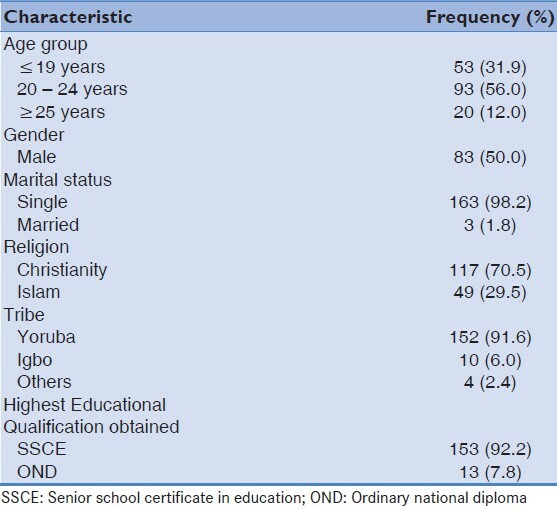 Most (98.2%) of them were not married and majority of them belonged to the Yoruba tribe (91.6%) [Table 1]. 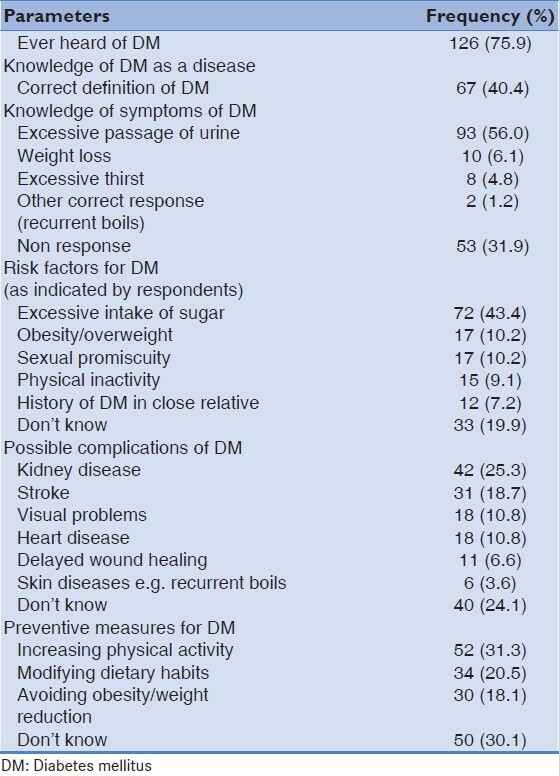 Most of the subjects (75.9%) had heard of DM but only 67 (40.4%) of them could correctly define the disease. More than one-half (56.0%) correctly stated that excessive passage of urine was a symptom of DM. However, about one-third of them could not correctly mention a symptom of the disease. Seventy-two (43.4%) of the study participants wrongly associated excessive intake of sugar with development of DM and only 29 (17.9%) of them stated the correct risk factors for DM (obesity/overweight, family history of DM). About one-fifth of them did not know any risk factor for DM. Forty-two (25.3%) correctly identified kidney disease as a possible complication of DM and a similar proportion (24.1%) could not identify any possible complication of DM. About a one-third of the study participants admitted not knowing any preventive measure for DM [Table 2]. 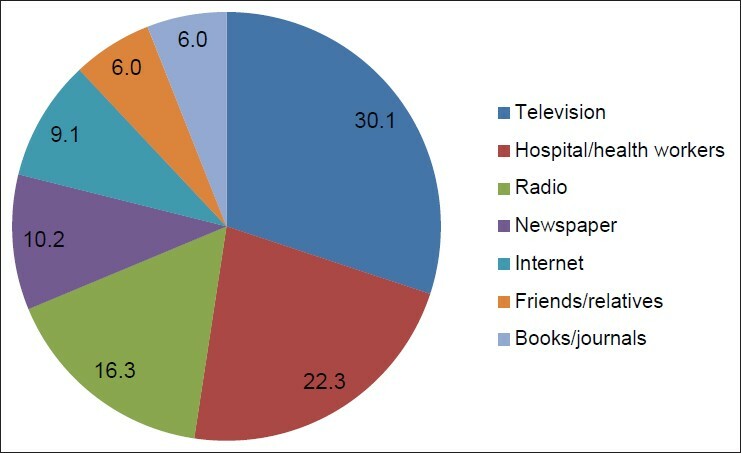 The most popular source of information of DM among respondents was through the media (television 30.1%), followed by the hospital/health workers (22.3%) and radio (16.3%) [Figure 1]. In response to the questions examining their perception and attitude to DM, 92 (55.4%) of them agreed it was a serious disease, 17 (10%) said it is curable and 15 (9.0%) said it is nothing to worry about. About a quarter of them simply did not indicate their perception of DM in terms of disease severity. Only 12 (7.2%) said they had ever been screened for DM and 110 (66.3%) indicated that they would be willing to screen for DM if opportune [Table 3]. More than one-half (66.9%) of study participants indicated that none of their relatives had ever been diagnosed with DM. Of the 25 respondents (15.1% of total) who said they had a relation with diabetes, 14 (6%) of them said the diabetic relation was their first degree relative (parent or sibling). This may likely result in better knowledge of and better attitude toward DM (such as willingness to screen for the disease and adopting lifestyle habits geared toward DM prevention). Sixty-one (36.7%) of subjects engaged in daily consumption of soft drinks, about one-quarter in consumption of fast foods and only 8.5% engaged in daily physical exercise of up to 30 min.Only 6.0% of the participants had ever heard of body mass index (BMI) and none of them had their BMI calculated in the 3-6 month period preceding the study [Table 4]. The study reflected a relatively high level of awareness of DM amongst study participants (75.9%). This was not unexpected considering that these were tertiary education students, a finding in congruence with that of Kulkarni et al., who recorded an awareness level of 75% among college students in a study conducted in Bijapur, India  but the awareness level was lower than the finding of Mohieldein et al., in another study conducted in Saudi Arabia in which 100% of the study participants were aware of the disease. However, the knowledge about DM among study participants is poor as demonstrated by the responses including poor definition of diabetes, and inability to discuss the symptomatology of the condition, as well as the associated risk factors. About a one-third was not aware of the preventive measures. A substantial proportion of the study participants relied on the mass media, with friends/relatives being least indicated as source of information as opposed to the findings of Mohieldein et al., who reported friends/relatives as their respondents' most important source of information on DM. In our study, hospital/health workers constituted 22.3%, a figure similar to that found by Mohieldein et al., (19.1%)  while Sabra et al., reported an even lower figure of 17.8%. This may suggest a gap in the provision of educational services on DM by health workers. Although many of the respondents would like to have DM screening if they are provided with opportunity to do so only 7.2% of them had ever screened for the disease. This is despite the fact that more than one-half of them perceived it to be a severe/possibly fatal disease. It is worthy of note that about a one-third of them were unwilling to be screened for the disease even when presented with an opportunity to do so. Also, only 6% of study respondents alluded to having heard of BMI, none of them had calculated their BMI in the 3-6 months period preceding the study. The knowledge of a disease plays a vital role in its prevention/control. This study shows a relatively high awareness level of DM among the study participants but the knowledge and attitude toward the disease is not commensurately high. Respondents demonstrated a limited level of knowledge and have not adopted lifestyle practices geared at preventing the disease. 1. Hjelm K, MufundaE, Nambozi G, Kemp J. Preparing nurses to face the pandemic of diabetes controlled trial of the effect of education about mellitus: A literature review. J Adv Nurs 2003;41:424-34. 2. Moodley LM, Rambiritch V. An assessment of the level of knowledge about diabetes mellitus among diabetic patients in a primary healthcare setting. S Afr Fam Pract 2007;49:16. 3. Abegunde, DO, Mathers CD, Adam T, Ortegon M, Strong K. The burden and costs of chronic diseases in low-income and middle-income countries. Lancet 2007;370:1929-38. 4. International Diabetes Foundation. Diabetes Atlas. Available from: http://www.idf.org/diabetesatlas/. [Last accessed on 2012 Jul 2]. 5. Diabetes Action Now. An Initiative of the World Health Organization and the International Diabetes Federation. WHO library cataloguing-in-publication data. Geneva: WHO; 2004. 6. WHO. Diabetes cases in Africa to double in next 25 years. Bull World Health Organization ISSN 0042-9686. 2004;82:397-8. 7. Chiasson JL. Prevention of type 2 diabetes: Fact or fiction? Expert Opin Pharmacother 2007;8:3147-58. 8. Zinman B, Harris SB, Gerstein HC, Young TK, Raboud JM, Neuman J, et al. Preventing type 2 diabetes using combination therapy: Design and methods of the Canadian Normoglycaemia Outcomes Evaluation (CANOE) trial. Diabetes Obes Metab 2006;8:531-7. 9. Wee HL, Ho HK, Li SC. Public awareness of diabetes Mellitus in Singapore. Singapore Med J 2002;43:128-34. 10. Gunay T, Ulusel B, Velipasaoglu S, Unal B, Ucku R, Ozgener N. Factors affecting adult knowledge of diabetes in Narlidere health district, Turkey. Acta Diabetol 2006;43:142-7. 11. Angeles-Llerenas A, Carbajal-Sánchez N, Allen B, Zamora-Muñoz S, Lazcano-Ponce E. Gender, body mass index and socio-demographic variables associated with knowledge about type 2 diabetes mellitus among 13,293 Mexican students. Acta Diabetol 2005;42:36-45. 12. Murugesan N, Snehalatha C, Shobhana R, Roglic G, Ramachandran A. Awareness about diabetes and its complications in the general and diabetic population in a city in southern India. Diabetes Res Clin Pract 2007;77:433-7. 13. Ulvi OS, Chaudhary RY, Ali T, Alvi RA, Khan MF, Khan M, et al. Investigating the awareness level about Diabetes Mellitus and associated factors in Tarlai (Rural Islamabad). J Pak Med Assoc 2009;59:798-801. 14. Al Shafaee MA, Al-Shukaili S, Rizvi SG, Al Farsi Y, Khan MA, Ganguly SS, et al. Knowledge and perceptions of diabetes in a semi-urban Omani population. BMC Public Health 2008;8:249. 15. Kulkarni GV, Udgiri M, Angaddi MM, Sorganvi VM. Knowledge about diabetes mellitus and its control among college students. Int J Cur Res Rev 2012;4:83-7. 16. Mohieldein HA, Alzohairy MA, Hasan M. Awareness of diabetes mellitus among Saudi nondiabeticpopulation in Al-Qassim region, Saudi Arabia. J Diabetes Endocrinol 2011;2:14-9. Available from: http://www.academicjournals.org/JDE ISSN 2141-2685 ©2011 Academic Journals. [Last accessed on 2012 Aug 28]. 17. Sabra AA, Taha AZ, Al-Zubier AG, Al-Kurashi NY. Misconceptions about diabetes mellitus among adult male attendees of primary health care centres. S Afr Fam Pract 2010;52:344-9.